I am at the European Conference on Educational Research (ECER) in Vienna. It is a big conference with 2050 registered delegates. ECER is organised through into 27 or so different strands, each run by a network, on issues like the Philosophy of Education, the Professional Development of Teachers, Pre-school Education or so on. I am working with VETNET, the Vocational Education and Training Network, which with some 120 delegates is the largest of the networks. As part of a small project promoted by VETNET we are producing multimedia from the conference. It is fairly hard work and a lot of fun. But the main point of the project for me is to demonstrate the potential use of ICT for enhancing the ECER conference. Despite many presentations dealing with different issues related to technology, and a relatively small network, Network 16, focusing on ICT in education, there is little use of technology at the conference, other than using data projectors for powerpoint! As far as I can see only 4 people have twittered using the #ECER2009 hashatag. There is no conference social networking site. The programme comes in a big printed book and, with so many sessions, is difficult to follow. There are no data screens, no live streaming, no means for involving a wider audience unable to attend the conference. Few delegates have a computer open during presentations (despite an excellent, free wireless network), indeed I suspect many frown on me typing away (and twittering the conference) during sessions. Yet ECER organisers I have talked to are interested in these ideas. It is just that it lies outside their experience. And indeed, given the lack of twittering, I suspect that the culture (or community) of educational research has not yet embraced these technologies. It is certainly a reality check for those of us working in the educational technology community. And given the importance of educational research for the future of teaching and learning, I think it is worrying. If the teachers of teachers, have little or no engagement with social networking technologies, it may be a long time before education finally engages in this area. NB We have done some wonderfull interviews (audio and video) with many people at the conference. Hopefully we will start getting these online next week. On Sunday there is a general election in Germany. Readers may be interested to see that the fastest growing party in Germany is the Pirate Party. Although they are unlikely to win sufficent vites ot enter Parliament, the Pirate Party is sunceeding in promoting a debate over civil rights and restrictive copyright laws. Wikipedia describes the party’s programme as follows. “The party opposes the dismantlement of civil rights in telephony and on the Internet, in particular the European data retention policies and Germany’s new Internet censorship law called Zugangserschwerungsgesetz. It also opposes artificial monopolies and various measures of surveillance of citizens. The party favors the civil right to information privacy and reforms of copyright, education, computer science and genetic patents. It promotes in particular an enhanced transparency of government by implementing open source governance and providing for APIs to allow for electronic inspection and control of government operations by the citizen. The party opposes the dismantlement of civil rights in telephony and on the Internet, in particular the European data retention policies and Germany’s new Internet censorship law called Zugangserschwerungsgesetz. It also opposes artificial monopolies and various measures of surveillance of citizens. What does digital democracy mean? I have always been unsure exactly what the term digital democracy meant. Voting by internet? Streaming Parliamentary proceedings? Providing policy documents for download? Members of Parliament twittering? None of this seemed very radical or indeed participative. But I am greatly taken by Joss Winn’s WordPress based Write to Reply site. Joss has produced a site which allows commenting in depth and discussion on policy documents. 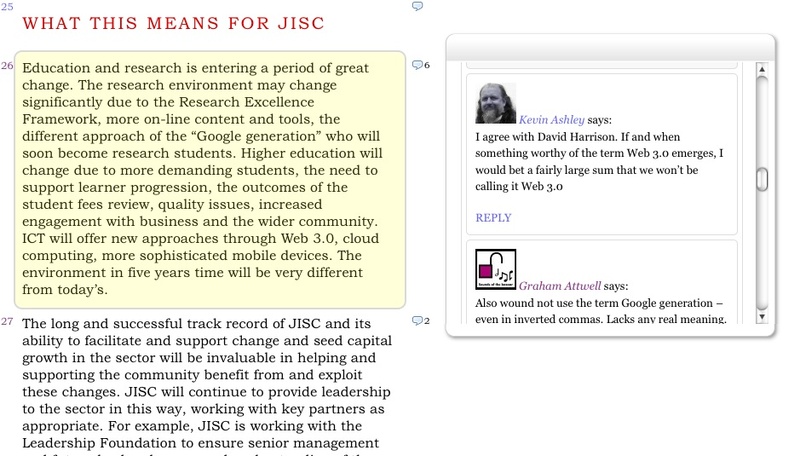 The site is presently hosting a discussion on the UK Jisc’s Strategy Review, 2010 – 2012. I particuarly like the ability to discuss each others contributions and comments on the policy review and also the granularity of the comment facilities. If Jisc take seriously the discussion, and there is every sign they will, given they are sonsoring the development, this promises to develop both a better strategy documents but also and most importantly to involve the wider community in a process of knowledge maturing. And that, for me, is what digital democracy is about. Technical note – I very much like that users can add comments without registering for an account and using the wordpress front end. One of the issues I have found with wordpress is that non experienced users struggle to understand the difference between the front end and the dashboard. Posted in politics, Social Software, Wales Wide Web | Comments Off on What does digital democracy mean? The conference season is in full swing. Next week I am off to Vienna for the European Conference on Educational Research. We will be working with the VETNET network to organise a series of podcasts fromt the conference in our ongoing Sounds of the Bazaar series (if you will be there and would like to come on the programme just send me an email). One of the problems with the big conferences (ECER will have over 2000 delegates) is what to go to. I find the printed programmes almost impossible to follow without a lot of pre-study time. Online programmes like Crowdvine, as used at Alt-C allow relatively easy browsing of the programme and the ability to develop a personal conference timetable. This is a great step forward – though sadly EERA is behind in developing such applications. However this is only half the problem. The bigger issue is understanding the type of session and the content. Traditional abstracts are not helpful and titles are often more obscure. All too often sessions turn out to be different than expected. In response to an earlier post Seb Schmoller from Alt asks “What is it about a session that you need to know to make a decision about whether to go to it? Inclusion of a micro-abstract – 140 characters max? Themes addressed? Type of session (demo, workshop, symposium, etc)? Level of experience aimed at? Where on tech/learning spectrum it lies? I think Seb has a pretty good starting list here. The level of experience aimed at is something I particuarly miss. I am interested in the use of social sowfatre in education. However, often I will go to a session, only to find it is an introduction to different social software applications and how they might be used in education. There is nothing wrong in such presentations – far from it. We need more of such presentations But I know this already. I need some way of knowing the level of the presentation or to whom it is addressed. I suppose Seb’s comment raises another question. Should we be trying to develop a standard in this area to allow the easy interchange of conference metadata. Would this be helpful or just another bureaucratic exercise? I’d be interested in people’s views on this. Some twelve years or so ago I was at a conference iN hong Kong. One of the sponsored presentations was by a local elearning company who demonstrated their mobile learning platform. I was totally sceptical. The screen was to small I said, no-one would want to learn on a phone. I was wrong. The thing the Hong Kong developers had got right was the idea that learning happens in context – in their case learning how to play Badminton – and the phone could allow access to learning in real time in any environment. What they got wrong was the lack of any real interaction – this was just a series of very short videos. What has changed is social software allowing interaction between people using mobile devices. Last week I had a meeting in a bar by the sea in Crete. We had one laptop, two ipods and an iphone. The internet cafe had a wireless connection and we were able to go on a virtual tour of a proposed confernce venue through the safari browser and then book our venue through skype. In this case the context was that a group of us from five different countries were in the same place and we wanted to work together. Over the summer I have been working with colleagues from the Mature project and with Mark van Harmelen on the idea of a mobile PLE based on Mark’s mPLE software. The more I have worked on this, the more I am convinced that mobile devices are integral to the idea of a PLE. But they also provide a challenge, not just to traditional course based education, but to ‘traditional’ notions of educational technology which is still very much wedded to VLE based courses. One of our central ideas is that learners will support each other through the social layers of a PLE and in particular will use such a device for collaborative problem solving in the context that the problem occurs. In such a situation the curriculum is essentially being evolved within the community and resources are co-developed by that community. I am not saying that such an approach will replace traditional education – or that everyone will want to develop their own PLE. But I am convinced the opportunity is there – if educators and educational technologists can grasp the idea of contextual learning using mobile devices. NB If you are interested in trialling the mPLE contact Mark van Harmelen. The debates around the themes I talked about in my report on AltC last week have not gone away with a weekend of fantic blogging and twittering. This week I will try to write a series of posts expanding on the ideas being discussed. But first I have to get some administration done. So here are just a couple of quick catch up points on some of these memes. As I said last week, Open Educational Resources are hitting the mainstream, raising issues of institutional approaches and strategies. Should publishing as OER be prescribed for academics? What are the business models for supporting OERs? How can resources be discovered and reused? What is an ‘open scholar;? Tonight is the first of a new series of Evolve / Educamp open online seminars on open content with presentations by Martin Weller and Martin Lindner. The seminar takes place on the Elluminate platform – just click this link to access it – at 20.00 Central European Time, 1900 UK time. And for those of you interested in the “Is Twitter killing Blogging?” debate, there is an interesting dicussion continuing on the Cloudworks site. Cloudworks also hosts another page bringing together many of the contributions around “The VLE is Dead” debate. The people are always the most important part of any conference. Alt-C brings together a wide cross section of the educational technology community in the UK and it was great to catch up with old and new friends alike. The best ‘people bit’ for me was F-Alt – in providing spaces for like minded folks to share ideas in an informal atmosphere. I usually skip keynotes but this year went to all three – with Michael Wesch, Martin Bean and Terry Anderson (for recordings of keynotes and invited speakers see – http://elluminate.alt.ac.uk/recordings.html). I greatly enjoyed Michael Wesch but am not sure he said anything new. Great style, great use of multi media, but I fear he is slipping into the ‘digital natives’ school of which I am highly sceptical. Twitterers (including me) were a bit hard on him, I think. Martin Bean is the Vice Chancellor (designate) of the UK Open University. He jumped on the stage in a burst of energy and fairly wowed the audience. High points – explicit support for Open Learn and the forthcoming Social Learn platforms and services. Curious omissions – no mention of the OU Moodle platform or anything to do with assessment or business models. For me the best of the three was Terry Anderson. OK – he does not have the same presentation charisma. But Terry is a great researcher and I particuarly liked his ideas about open researchers. I have to say I was a little disappointed with the programme. Although the Crowdvine site makes it easier to find out what is going on when, I still found it quite difficult to make decisions what sessions to go to. Traditional conference abstracts do not really help much. It is not really Alt’s fault ,but I think the strand titles (and conference themes) could be more transparent. One problem is that in such a big conference people naturally have different levels of experience and different interests. Although many of the sessions I went to were well presented, from some I did not really learn anything new. Being an ed-tech conference, the tech being used is always interesting. Alt-C had a much bigger online presence this year, allowing people to follow even if not physically present. Alt-c used Crowdvine for the second year, Cloudworks also set up an online confernce site and Manchester University provided a reliable and reasonably fast wireless service. But of course it was Twitter which dominated the event with hundreds of posts tagged with #AltC2009. How much did Twitter add to the conference? I am not sure – it is a great communication channel but I still have my doubts as to its value for reflective discourse. This is going to be somewhat impressionistic, being based meainly on things I was involved in or things I talked to others about. The idea of Open Educational Resources seems to have mainstreamed, being seen by many institutions as teh best way to develop repositories and license resources.Whilst it was hgard to see any new busniness models for OER drvelopment, many institutions seem to be adopting OERs as a strategic reponse ot present economic and social challenges and pressures. How important is the technology? The VLE is dead debate organised by James Clay, ably chaired by Josie Fraser and with short inputs from James, Steve Wheeler, Nick Sharratt and myself was well attended F2F and via a stream. It has certainly caused lots of discussion. Pretty obviously despite all the interest in social software and PLes, VLEs are alive and kicking. Personally I would have liked to see more discussion on how the benefits of educational technology can be extended to lifelong learning and to those outside the institution but maybe Alt-C is just not that kind of conference! Great fun and may the debate continue. The post-technical then does not put technology second or first, it simply liberates the debate from those who build/code/provide the technology and puts it into the hands of those who appropriate it, the users, or ‘people’ as I like to call them, who write essays and poetry in Word, transform images in Photoshop, sustain friendships in Facebook, learn stuff by reading Wikipedia and express opinions in blogs. A meme to watch for the future, I think. Several excellent sessions around mobile technologies. I was also lucky to see a pre release demo of the forthcoming Doop augmented reality iPhone app mashing up with Twitter and Google myMaps. Very cool – will post more on this once it is ready. I greatly enjoyed Frances Bell at al’s Digital Identity session. Mark van Harmelen demoed the forthcoming mPLE. I loved Joss Winn’s session on WordPress goodness….more tomorrow when I wake up remembering all the great chats I have forgotten now. Lots of fun at yesterdays debate on the future of the VLE at the Alt-C Conference in Manchester, UK. James Clay, Nick Sharratt, Steve Wheeler and myself all were allowed to argue our position for five minutes and then we handed over to the audience. Great fun and lots of interesting contributions. It is surprising how attached to their VLEs these ed techies are :). For some time now I have been following the development of the Manchester Personal Learning Environment – now called the mPLE. As Mark van Harmelen explains the “mPLE was first conceived of a response to a perceived lack of usable open source software to support communities and learning in those communities. Informed by social constructivist and constructionist perspectives mPLE is designed to support individual and group learning activities. The intent is for mPLE to be used by self-directed and peer-assisting groups of learners (possibly teacher-led, but without any special status for teachers in the PLE). In order to support this vision of learning, mPLE combines a social software layer with advanced multi-user multi-media spaces where learners can meet and collaboratively perform learning activities in real time. You can read more about the mPLE on the Hedtek blog. Hedtek Ltd will demonstrate and discuss the Manchester Personal Learning Environment (mPLE) at two fringe events during the ALT-C 2009 conference. The Kilburn Building is next to the conference location. This coming week is the annual Alt-C conference. And, as is becoming standard for conferences these days, many of the sessions will be freely available on line. Alt-C themselves are broadcasting the keynote sessions through Elluminate. Terry Anderson, Professor and Canada Research Chair in Distance Education at Athabasca University, Canada – Canada’s Open University, Thursday 10 September, 11.55 to 12.55. Just head over to http://elluminate.alt.ac.uk/ to access these sessions. But it is not just the keynote sessions that can be followed online. Many other session organisers are planning some form of on-line participation. Tuesday, 8 Steptember, 1340 – 1500 UK time sees a debate on the future of Virtual Learning Environments, entitled “The VLE is dead” with short (and lively!) contributions from James Clay, Steve Wheeler, Nick Sharratt and Graham Attwell. The event will be broadcast on Ustream. Deatils to follow. Wednesday sees a Jisc Emerge symposium on Institutional Change entitled “Emerging practice and institutional change symposium: a user-centred, learning technology R&D support-community network“. Speakers include George Roberts, Isobel Falconer, Josie Fraser and Graham Attwell. The symposium runs from 9.00 to 10.20 UK time. You can watch the Ustream for this session on the Emerge portal and of course contribute through Twitter. For those of you living near Manchester but not enrolled for the conference, the wonderful fringe programme organised by F-Alt is open to all. Check out the programme on the F-Alt wiki (hash tag #falt09). And of course, many other sessions can be followed on line. More details on the official conference Croudvine site or follow on Twitter on the #Altc2009 hash tag.